Are you nervous about doing a boudoir session or just curious? We totally get it - this is wildly outside of the box for 99% of our clients - we get it. First of all, it's helpful to talk on the phone (call us! 310.929.7732) and ask as many questions as you want and also it's great to hear other people's experiences! 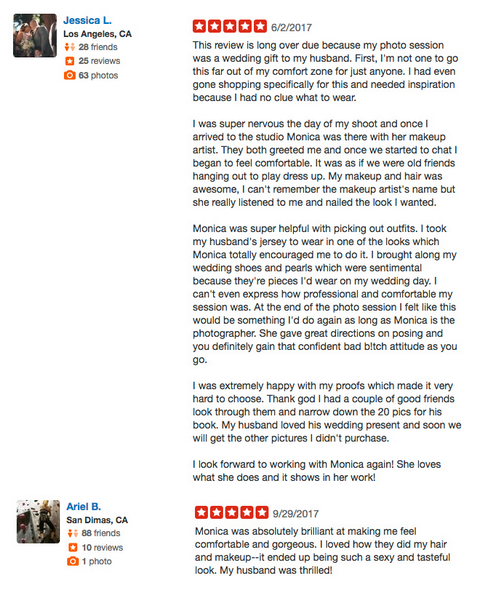 Read these reviews and so many more over on our Yelp page!